Do not blame the increase of tagging errors on inexperienced users. Clipper was not designed with a user friendly interface. Users only need to tag the card, but the response is so slow that users think it's not working and remove the card before the transaction is completed. The fact that you via your blog, and Clipper people in the metro stations have to teach users how to use the card is already a good indicator that the Clipper system is not user friendly or intuitive to use. If Clipper system were intuitive and user friendly, then you would not have to repeatedly emphasize tagging vice swiping and reporting user error. And then we have the craptacular gates that do not tell the remaining balance on the card and designed to close in between users attempting to exit the Metro system. In many cases, the gates are closing on people right as they get to the gate. Users are, instead, exiting via the emergency swing gate. The Clipper system is being forcefully deployed with little benefit. Hundreds (thousands?) of users exiting through the emergency gate is a pretty good indicator that the metro gates are broken or poorly designed. Look at EZ-Rider users and compare it to Clipper. One Clipper user take as much time as 3 EZ-Rider users. Why would anyone want to give up their EZ-Rider for inferior (slower) Clipper system if they were not forced to do so? IMO, Clipper is designed to work against transit users by slowing them down through entry and exit (if using Metro). The only selling point for Clipper, really, is that (casual) users do not have to figure out the fare for various transit systems. Frequent users will already know the fares and system or have their prepaid tickets. Anonymous: The tagging error information on this blog posting is from the BART documents and not from my own opinions. I agree the tagging process is slow and the process to do so is annoying. It's based on the equipment they bought, they got ERG equipment, the same stuff used in Hong Kong where people have to hold their card longer than other company products like Cubic's. EZ Rider card users got into BART quick because it was a Cubic card product with a Cubic gate. 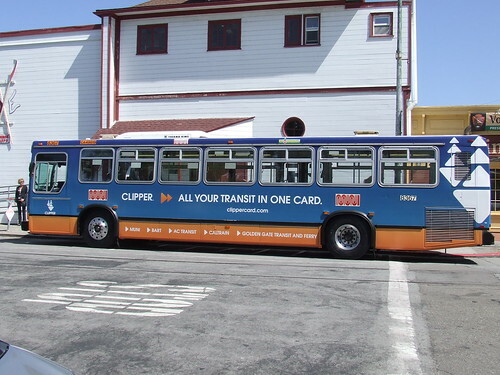 Clipper was originally owned by ERG until Cubic bought it, so they had to configure it to be able to work properly between the two products; thereby resulting in a slower read on BART gates. It's like those kids toys where one has to hammer the proper size item into the hole, Clipper is trying to hammer the square peg (ERG equipment) into the round hole (Cubic BART equipment), but to make everything work, Cubic had to shave the edges to make it just fit. The language issue is apparent if you ride the buses that serve Chinatown and Russian Hill. Yesterday morning I was on a packed 30-Stockton. People boarded from the front and back at Kearny street. Those in front tagged their cards or paid cash, but not all who boarded in the back tagged their cards. In fact, I saw an old man, in his 60-70s, board through the back and show his Clipper Card to the driver as though it were a Fast Pass. Before the A pass went Clipper only, I heard a group of Latina housekeepers talking about the transition on the 45. They had the misconception that trips to the East Bay on Bart & bus would cost them more. They also thought that the A pass was being eliminated and would have to pay $2 each way.